The Correct or Proper Way to Trim Shrubs. How to Separate Used Nursery Containers (pots) Easily. A Review of the Field Tuff ATV Cultivator. How to Sell Plants from Home. Braiding Golden Curls Weeping Willow Trees for Patio Planters. 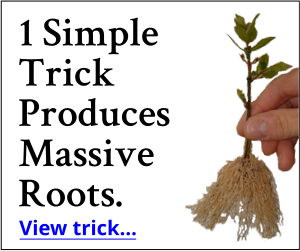 The Simplicity of Rooting Thousands of Cuttings in Your Backyard. Growing, Rooting and Propagating Dappled Willow in Tree Form from Cuttings.